From the middle of the 19th century, nationalistic currents in India began to be more and more pronounced. These were the result of English education making itself felt amongst the wealthier class of Indian on the one hand, and the efforts of indigenous reformers on the other, who felt that Indian traditional culture and customs were in danger of being wiped out by European culture. The first lot would go on to espouse increasing modernity and appropriation of the industrial, financial and governmental institutions of the West as a way for India to catch up with the developed world, while the second category would militate for a return to traditional values and culture systems as the path for India to recover her lost glory. These streams have been variously classed as the Modernist movement and the Swadeshi/Revivalist movement, but it is also equally certain that these labels have been applied with the advantage of hindsight, and that at the time there were no clear-cut differences between various people working for or towards a pan-Indian nationalism, but rather different points of view as to how to best achieve the target of greater self-sufficiency, autonomous decision-making and safeguarding and preserving what remained of Indian traditional skills and customs. As with all beginnings, here too a philosophy of nationalism had to be worked out before it found an echo in art and architecture. In Bengal, the Tagore brothers (Rabindranath, Abanindranath and Gaganendranath) were the chief founders of what would be later called the Bengal school of artistic thought. Strongly revivalist in character, the school would be known later for housing and giving patronage for artists from all over India, with an emphasis on folk themes, the rejection of European techniques and a search for a pan-Asian art form. These ideals would find an echo in the architecture of Shantiniketan, Rabindranath Tagore’s school of art and culture begun in 1901, providing education from the pre-school to a graduate level. Shantiniketan’s development would be closely identified with that of the nationalist movement, especially the so-called ‘swadeshi’ branch. It was inevitable, then, that the architecture of Shantiniketan would search to find appropriate inspiration and symbology in India’s past. The school buildings have eclectic origins, ranging from Buddhist gateways and columns to Mughal and Rajput style window openings, even though the floor plan designs themselves remain far more functional. Gandhi was another nationalist whose ideas of life, nationalism and India’s future course are so well known that it would be futile to discuss them at length here. These ideals of simplicity, equality, austerity and non-violence found ample reflection in the architecture of the many ashrams which he established or patronized, both in South Africa and in India. 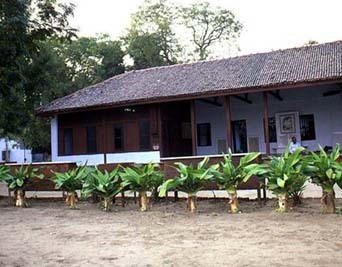 The Sabarmati Ashram at Ahmedabad is a very representative example. Here, the buildings emulate those in a simple village, with mud and brick construction, low thatched roofs and sometimes even straw mats for doors and windows. Open spaces between the huts and buildings continue the metaphor of village life, as did Gandhi’s insistence on self-sufficiency and dignity of labor. A curious movement would be started by Sris Chandra Chatterjee in the 1930s, curious because it was called the Modern Indian Architectural Movement but referred in the main to a pastiche of traditional symbology and elements stuck on the facades of fairly functional structures. In this sense it made for easy identification and was popular with indigenous clients because it contained visibly identifiable symbols from the past. 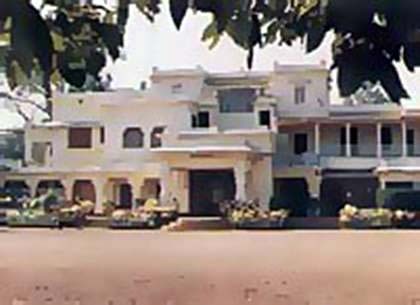 In 1940, Chatterjee was one of the patrons of the ‘All India League of Indian Architecture’, which had strong ideological roots in the architectural styles of Shantiniketan and Sabarmati Ashram. The stated intent of the League was the search for a specifically ‘Indian’ Architecture and among its aims were to write textbooks and manuals to further hone the skills of people who already had a background in construction or the arts (for example architects, engineers and painters). 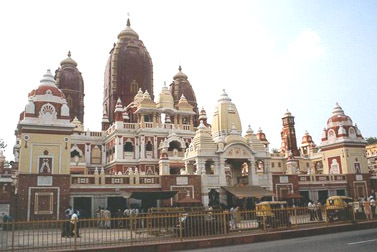 Chatterjee’s most famous work is the Lakshmi-Narayan Temple at Delhi, near Connaught Place, a colossal place of worship funded by the Birlas in 1938. Apart from this, he also built the Arya Dharma Sangha Dharamsala at Sarnath in 1935, as well as a project for the Deshbandhu memorial to the Princess of Agartala. A few urban planning projects were also inspired by these schools of thought. 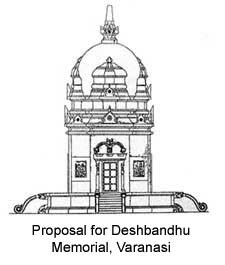 The plan (shown in the image below) of the Benares Hindu University (BHU) campus was supposedly based on Vedic principles, and so were many of the prominent buildings within it. It is clear now that the nationalist movement found a clear echo in art and architecture of the period. 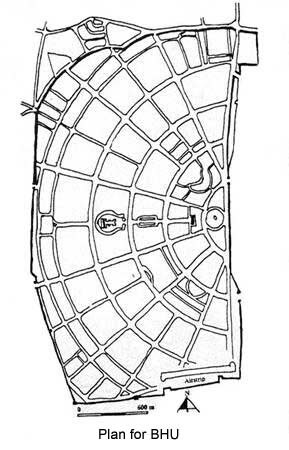 Architects attempted to search the past for appropriate symbology which could effectively be used in the present as a reflection of popular sentiment, a sentiment which was turning decisively against the British and eventually against all things ‘white’ and ‘foreign’. It is not clear how much they achieved architecturally, for much of the world from the period, even avowedly ‘revivalist’, is merely a cloaking of modern-age requirements and plans by a pastiche of elements chosen, if not randomly, then at least eclectically. However, what can be said with certainty is that the architecture of the time was an accurate reflection of society – a society seeking for self-definition and turning to one source of inspiration after another to find it.